Tracy Green knows drinking early and often helps level the playing the field against heat & humidity. How was your running last week? I thought so. It's hard to believe how much fitness you've lost over the last few weeks after a good spring of racing. Before you give up and take up another sport, possibly something of the indoor variety, let's talk about how you've been feeling. In addition to the loss of fitness, have you also lost confidence and wonder if your watch needs a battery change because it seems to be running slow, especially on the hard days? If so, let me invite you to join me in living by faith for the next month or two. Last Saturday's long run was a great test of my faith. I started plenty slow and made a point to drink at least 6-8 ounces every 15-20 minutes and felt fine for about an hour. At that point, without a increase in pace, the effort went up and I wisely decided to back off voluntarily to make sure I would get through the distance. A few more miles went by and then I slowed down some more, this time involuntarily. I had to remind myself that this was not my first summer of running and though I was running an effort that should have been a minute or more per mile faster, I was still getting the training effect. It's not just you and me. My smartest, toughest, and fastest runners are suffering the same symptoms. Take heart that there is a crowd of good company in our boat. Let's take a closer look at what the heat is doing to us. Most information on the effects of heat on running performance use dew point as the primary factor. 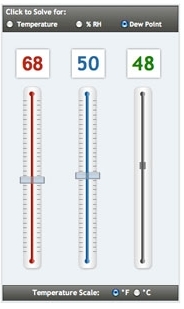 If you don't know the dew point you can find it with this calculator. A brief summary is that the following dew points result in the corresponding drops in performance. 60° = 2%, 65° = 3%, 70° = 5%, 75° = 12%, 80° = 15%. Note the accelerating decline as it gets warmer. Remember these are dew points and not simple air temperatures. Add the rule of thumb that you will slow down by 2% for every 1% in body weight loss due to dehydration and you are fighting a losing battle. There are several other factors including acclimatization (generally takes 2 solid weeks) and individual heat tolerance. Let's say the dew point is 75° and you have lost 3% of your body weight in sweat loss. If you would normally run 7:30 pace or 450 seconds per mile, the total of 18% loss of speed (12% for 75° dew point and 6% for the 3% dehydration loss) you could expect to slow down by 81 seconds per mile. So now instead of cruising along at 7:30's, you are now feeling lousy and running 8:51 pace. It's physiology. You might be tough and might tolerate heat better than most, but you will be working much harder to be remotely close to your normal pace. Calculating the dew point can help adjust expectations in heat and humidity. There are a few other things you can do along with living by faith until the weather cools again. Train consistently for adaptation and adjust expectations. Stay hydrated using salt tablets when necessary. Use your respiratory rate and perceived exertion as your primary measures of effort. Pace and HR will be affected to a degree that their reliability is no longer as helpful. Continue to rely on Run Smart, Run Hard. Heat will require you to emphasize the smart, the hard just happens. I'll look forward to seeing you again on the other side of summer when we are all running faster again! Newer PostGo Long: How Far, How Fast, & How to Fuel. Older PostLast Call - Mile Run!